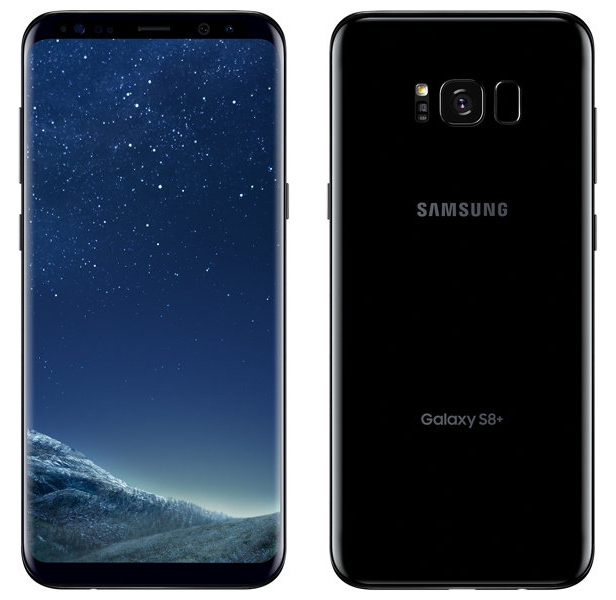 Looking for another deal on the Samsung Galaxy S8? You may want to visit Costco. The bulk retailer is now running a deal on the Galaxy S8 and S8+ that’ll get its members a $150 Costco Cash Card with the purchase of either T-Mobile model. The Costco Cash Card will be delivered via mail-in rebate. 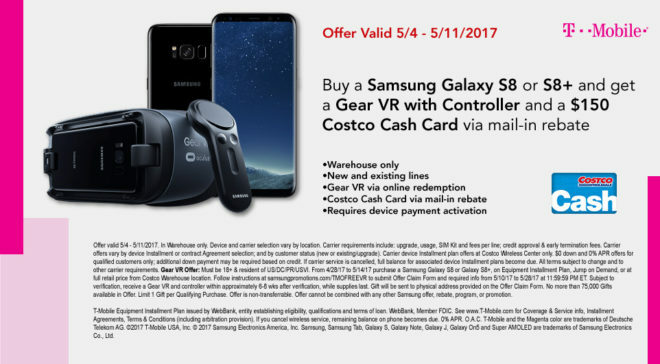 Also of note is that this deal includes Samsung’s offer of a free Gear VR with Controller, and Costco says that Galaxy S8 and S8+ buyers will receive a Tylt Power Essentials pack with activation. Samsung is also running an offer that’ll give Galaxy S8 and S8+ buyers a free Entertainment Kit with a Clear View Standing Case, 64GB microSD card, and six-month subscription to Netflix. To get this bundle, you need to register with your device in the Shop Samsung app. It’s unclear if this offer stacks with Samsung’s Gear VR deal, but it could be worth trying to get both. Costco’s $150 Cash Card deal is valid from May 4 to May 11, so you’ve still got some time to take advantage of it. The Galaxy S8 and S8+ just launched, so getting a $150 Costco rebate is a pretty nice deal for the new Android flagship, and the added accessories make the offer even better. I already have a T-Mobile family plan. Does this work for existing T-Mobile customers? Or do I have to make a new account? Do you know if it works with original jump? Costco doesn’t do JoD if you have it. Just plain Jump. I wouldn’t expect them to . Has to be a retail store and not all of them does JOD best beat is calling in or chatting. I got this deal last weekend at Costco for my T-Mobile S8, and it was $200 in Costco cash gift cards. That’s strange that they would have lowered the gift card amount. yeah, but instead they are giving away that VR accessory. My concern is: is this dealer any good as far as being fair to customers? Ultimately, they are no TMobile, nor are they Costco. I received the $200 gift card, the gear VR, and the accessory kit last weekend. And as for the dealer, it’s an authorized retailer at a kiosk inside Costco, so they can access your plan, make changes, add lines, upgrade phones, etc., just as a normal T-Mobile store could do. This has been the only deal for the S8 on T-Mobile so far, so it’s the best place to get the phone for now. Used my jump for two lines for 150 for each line plus all the other goodies, and no down payment. I have the original Jump and am looking at this deal, how much did you pay total? I see it says no money down but do you still have to pay the taxes on the phone like when you get it from Tmobile? Thanks. The S8 appears to be too fragile to be without a case under my normal daily use. I would need to have a case that would essentially disrupt the unique curved side screens. Then paying the $100 premium tax ($650 S7 base vs $750 S8 base) is gone, which is why I this phone would probably be a good buy around $500. The $150 Costco cash brings it down to $600, but still needs to go further for my wallet. I’m most likely going to hold off until OnePlus 5, Pixel 2, and V30 come out to make a LG G4 replacement purchase. This may push the early 2017 phones like the G6 and S8 come down in price to the $300-400 range. Completely agree. I hope LG doesn’t ditch the removable battery on the V30 like all other manufacturers. I may even switch to the iPhone. At least the support and resale are good on those. Be careful with this I submitted promos for phones we bought through costco, over a month ago and they are still fighting us on the accessory packs and gift cards we are supposed to receive. That doesn’t make sense at all seeing there’s a restock fee…and the travel time lol.